You probably know about the massive power of the Voltric 80 or the perfect balance of offense and defense of the Voltric 70. Those are magnificent rackets, but they are expensive as well. Yet, there’s nothing worry about, because the Yonex Voltric 7 comes at the rescue, bringing you many of the advantages of the Voltric line at a very affordable price. This racket delivers excellent power and speed. If you want to know more about it, then come with me as I review it for you in detail. Excellent power. It hits very well with every single shot. Great defense. It defends very well thanks to its speed. Solid control. It feels solid and brings you plenty of control. If you are looking for an affordable racquet capable of hitting hard and being very fast for some great defensive shots, then the Voltric 7 is everything you need. It’s budget-friendly, powerful and fast. Yes, it cannot compete with the Voltric 80, 70 or Z Force II in the department of power, but it’s still pretty good for the price. Still have doubts and questions? Then just keep reading and solve them all with a more detailed review. Right off the bat you can tell that it’s different in terms of design in comparison to the Voltric 5. It uses a mixture of black, white and red. It’s a daring design, yet, it’s cool. It’s fast and powerful. It’d be a mistake to compare it to the Voltric Z Force II or the Voltric 80, because it’s much cheaper. Yet, it’s a racquet that allows you to deliver powerful shots and move fast. And this is all thanks to the cutting-edge Tri-voltage system. It makes your racquet powerful and agile at the same time. It’s highly versatile due to that, which will allow you to attack with power and defend with ease. Even though it’s not the best choice for defensive-style players, it’s still a good option if you take into account its price. 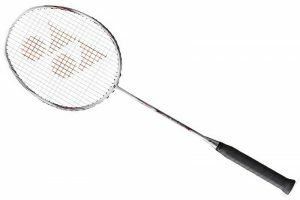 If you are looking for a badminton racket for sale that’s designed for that kind of player, then you can check the Nanoray Z Speed or the Nanospeed 9900. Do you hate rackets that slip away? I really those too, but worry not, because the Voltric 7 comes with a control support cap which makes gripping better, and hence, improves maneuverability and control. Play with confidence, play with total control. Improved stability. A common defect in many cheap racket is that they do not do a good job at absorbing energy and decreasing torque, but with the Voltric 7 it’s a different case. Because thanks to this tech you will enjoy a super-stable and torque-free racket. Hate missing shots? I hate that too, because there’s nothing worse than hitting the shuttle without precision. Thanks to the isometric shape of the frame you will have an easy time hitting the sweet spot. All I can say is that it’s an excellent budget-friendly choice thanks to its great power and nice features that make it fast and highly maneuverable. And now it’s time to review its performance in the game by checking different types of shots. From now I can tell you that this racquet has an excellent performance in the game, especially when attacking. As expect, serving with this racket is pretty easy. The heavy weight of the head along with the enlarged sweet spot make it easier to throw a powerful yet accurate serve. If you want smooth, powerful and effortless clears, then the Voltric 7 can bring you such thing. You couldn’t expect any lesser from a Voltric. Once again, it shines in the power department. You can smash as hard as you want. Although, it doesn’t matter if you are not very strong, because the heavy head along with the tri-voltage system make it easier for you to deliver powerful smashes. Drives are quite decent. The racquet is lighter than a Voltric 80 and offers solid control and excellent maneuverability, which grants it fast reactions that make it an excellent performer in defensive drives. Although, it does a good job in the offensive department as well. It’s a Voltric, you cannot expect any lesser from it. Just like smashes, it’s easy to deliver super-strong net kills that most players will have a hard time blocking or countering. This racquet is an excellent option if you are in a tight budget, because regardless of its low price, it’s a top-notch performer.